An eyesore building in a Moray town centre has been approved for demolition for the second time after the initial proposals were blocked by the Scottish Government. The 19th Century former tobacconist and tackle shop at 184 – 188 High Street in Elgin has been lying empty for more than a decade. Plans were first submitted nearly three years ago to dismantle and rebuild the historic facade while knocking down the buildings behind to make way for a shop and 15 flats. However, despite the structure being on the brink of collapse, Historic Environment Scotland objected to the original proposals – a position later supported by the Scottish Government which led to them being thrown out. Now the council has approved the demolition request from developers Action Elgin for the second time after the heritage agency dropped its objection due to the building being downgraded from B to C-listed. Yesterday the firm behind the project explained the boost would help to bring activity to a neglected part of the town centre. 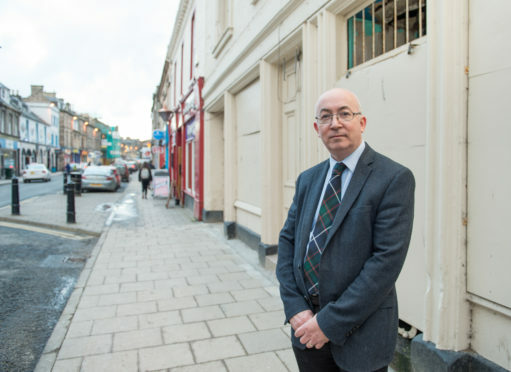 A spokeswoman said: “It has always been our vision to attract more people and businesses to Elgin High Street and we are pleased to have been given the approval to move forward with this regeneration project. It is understood that the flats, which will all be one-bedroom, will be marketed towards NHS staff, military personnel and other professions who need accommodation for short periods of time. Councillor Marc Macrae was chairman of the council’s planning committee when a bid was made to try and keep the project alive by the authority. He said: “If that building had just been left then there was a chance that it was going to collapse on its own in the future, with or without any plans for it given the state of disrepair it’s in.